Governance at Chigwell Primary Academy has been delegated by the REAch2 Trust Board to a Local Governing Board made up of individuals drawn from the Academy’s community, both as elected and appointed members. The Local Governors are accountable to the Regional Board and through this body to the Trust Board. Assist in delivering the vision and ethos of REAch2 for the Academy. Ensure that the Academy achieves the aims and ambitions it has for its pupils. Implement and review the strategic plan for the Academy, especially plans for school improvement. Chigwell Primary Academy we welcome the involvement of and feedback from parents/carers and the local community. Governors regularly attend events at the school and are always happy to hear the views of the schools community. 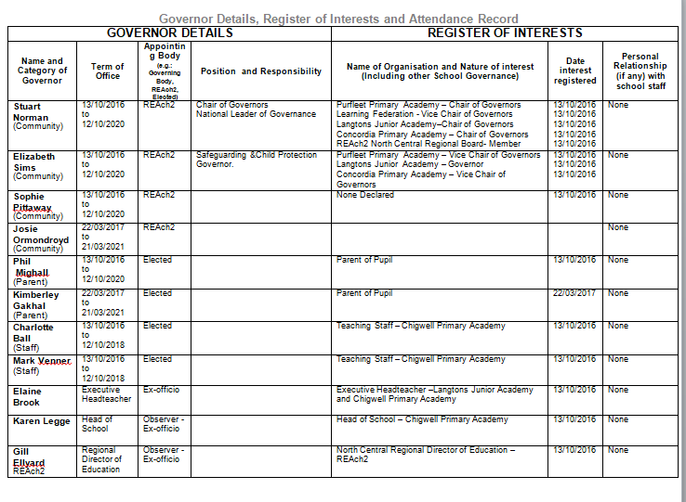 Full Governor details (including attendance at meetings of the Transition Board September 2015 to September 2016) can be found below. For more information about governance please refer to the governance section of the REAch2 website: http://reach2.org/governance-policy/governance/ or contact Mr Stuart Norman, Co-Chair of Governors via the School Office.